Gift Box made of Cinnamon that contains Cinnamon! Here’s a fantastic gift for the cook in your life. World Vision has this wonderful round wood box that measures about 3 inches by 3.5 inches. It’s a solid wood box carved out of the bark of the Cassia tree. 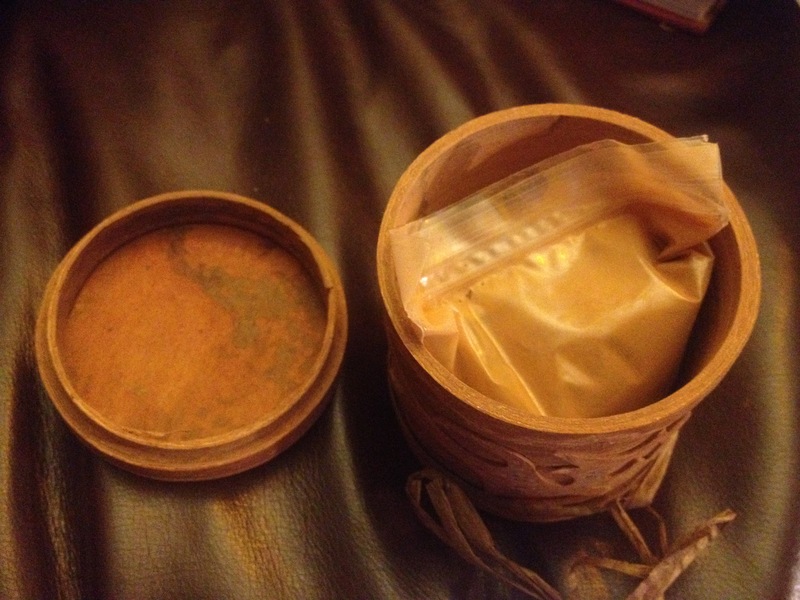 It’s round and comes with a lid (also made of Cassia bark) that you can pop on and off. 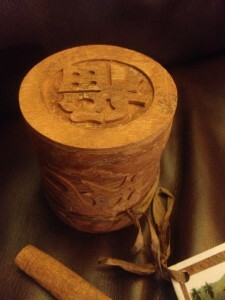 The lid also has the word “fu” carved into the top, which is the Chinese word for “fortune” or “prosperity”. The side of the box is carved with a figure that resembles a dragon. If you’re not familiar with the Cassia tree, it happens to also be the tree that produces Cassia cinnamon. Not only does this box smell wonderful, it also comes with a cinnamon stick and a pamphlet that explains how buying this gift helps a great cause. These cinnamon boxes are crafted in a home-based workshop in the town of Tra Bong located in Quang Ngai province of central Vietnam. Quam Ngai is the shared homeland cohabited by the Kihn people and three other fraternal ethnic groups: Hore, Kor, and Kadong, who always stand side by side for the sake of mutual interest and progress. Quang Ngai is south of the DMZ and also was the scene of heavy combat during the Vietnam War. Cinnamon has long been an important resource for these communities. Its high oil content and powerful flavor make Vietnamese cinnamon arguably some of the finest cinnamon in the world and an important export commodity. 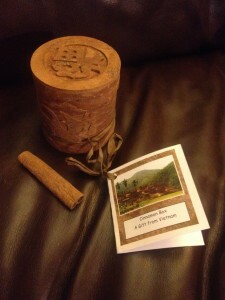 Unique to Vietnam is the traditional craft of using the bark of cinnamon trees to create beautiful and aromatic gifts. The fair wages they receive allow them to feed and educate their children, and improve their working conditions; all of which contribute to their hope for lasting peace. What’s even cooler about this gift is that it comes with actual cinnamon in a bag for you to pour and store in the box. As I mentioned in the last post, I’ll be using my Neilsen-Massey Vanilla and my World Vision Vietnamese Cinnamon in a recipe shortly and will update this post to show you how these two great gifts can work together. World Vision outdoes itself more and more each year. While they have some gifts that are symbolic, their Web site also allows you to choose actual handcrafted gifts from African soapstone boxes to Kenyan wooden serving spoons to Indian silver cuff bracelets to Vietnamese scarves and much more. When you purchase these, World Vision is helped, but you also help craftspeople are artisans in local communities in developing areas earn a living. The World Vision gift catalog started in Christmas 1996, making this the 19th annual edition. It raised over $33.7 million in 2013, helping more than 844,000 people around the world. There aren’t many other gift choices that gives three times: once to your recipient, once to World Vision’s vital efforts to help the world’s most needy, and once to help people in those needy areas make an honest and respected living.